High precision turning machine to achieve desired tolerances and run outs for Commutator and Slip Ring turning. These machines are specially manufactuered for simultaneous turning of commutator and stack in armatures and slip ring and claw pole in rotor. AIDA presses that feature ServoPro technology, like the NS2-D Straightside Servo Press, have unique high torque, low RPM servo motors as well as a direct drive system that enables metalforming processes previously unavailable in conventional mechanical stamping presses. Electro Mechanical Assembly Presses or Servo Press are suitable for precise and flexible assembling and joining for a broad area of applications. Leveraging on our vast knowledge of this realm, we are betrothed in presenting an optimal quality series of Servo Feeder Press Machine. To accomplish the numerous requirements of the clients, we are engaged in providing a high quality range of Servo Press. 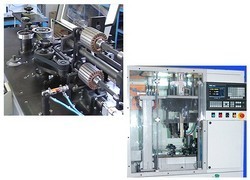 Equipped with the latest version of servo motor technology from Japan, greater ability, stronger, applicable to interchange curve graph as expected, free forming limitation, challenge top rated press technology. Hind servo presses are fully programmable motion controlled ball screw press. Integrated sensors provide a closed loop feedback system which is required for accurate control during pressing operations. 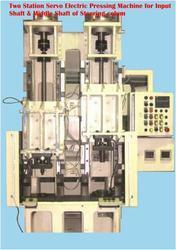 These servo presses are optimum for your most challenging and critical pressing requirements.